Yes, the RPM Challenge comes to an end again… and I’ve got another album. 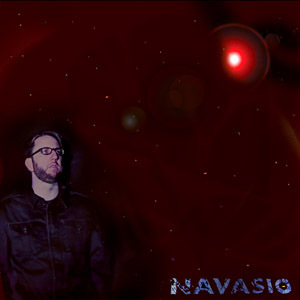 This one is titled “Navasio” and features 5 songs which provide 36 minutes of music. And you know what, I’m pleased with it. I actually like listening to it, which I find amusing. Even if everyone else hates it, I think I’ll still listen to it, and enjoy it… so that’s cool. I took a very different direction this year. In 2008 I was really just continuing the way I created music in 2007, which was… grab guitar and bass, plug them into my Mac, fire up GarageBand, find a beat, and start recording. Last year’s effort was pretty disjointed, but there were a few songs I really liked. It was a good learning experience, and that’s enough. Since 2008 I’ve moved up to using Logic instead of GarageBand, and also upgraded to using a Firewire audio interface (the Behringer FCA202.) I know that some people think Behringer is crap, or it’s inexpensive for a reason, but it served my purposes quite well. I had no complaints, it just “worked” which was good. Ah yes, the process… So in 2008 I would write/record a song, and immediately upload it to archive.org and then post it on this blog. It was quite a process. The whole “making a song” was typically compressed into a few hours. At the end though, it was more like, I just did the last song… it didn’t feel like I completed an album, so this time, I worked on all the songs until the last day of February. That’s not to say I didn’t still record most of them in one sitting (some I did, some I didn’t) but I did a lot more listening, and spent more time mixing and engineering the tracks (but not enough!) I would have loved to have had another few days to do mixes, listen, and tweak things… but at some point, you gotta be done, and with RPM, that point is February 28th. So by now you’re like… “Shut up already, let’s hear it!” and yes, yes… soon… I’ve got it out to a few people to get their opinions. People who also make music, or who I think might like it based on the genre it may inhabit. But rest assured, it will be available soon… online, for free, under a Creative Commons license… cuz that’s how we do it around here…. Posted on Monday, March 2nd, 2009 at 10:00 pm. Subscribe to the comments feed. Both comments and pings are currently closed. Post on your own blog. Pete, c’mon, man, get the tunes up! I’m holding myself over listening to last year’s songs, but c’mon!